Ever feel like technology is taking over your child’s life? Smart phones, iPads, computers and other devices can leave parents wishing for the good old days when we weren't all so well connected. Maybe you're longing for less Facebook, and more face time? 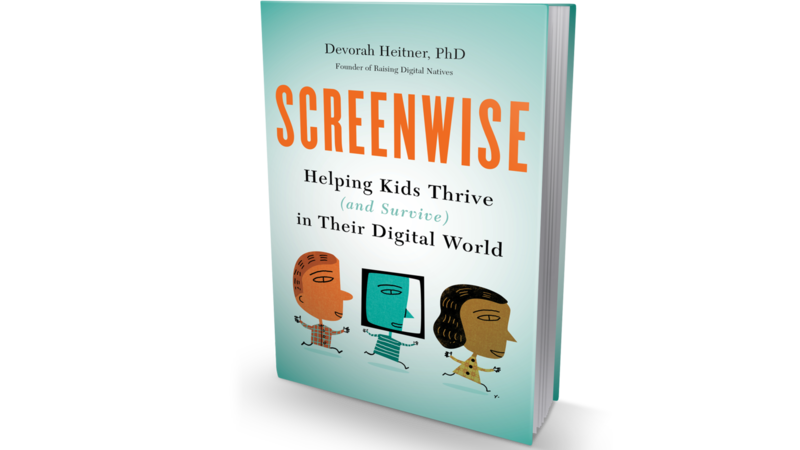 The new book “Screenwise: Helping Kids Thrive (and Survive) in Their Digital World” offers practical advice on how parents can plug into their children's changing media landscape. Joining host Phil Ponce is Devorah Heitner, the Chicago author of “Screenwise.” Heitner is a media historian and founder and director of Raising Digital Natives, a resource for parents and schools seeking advice on helping children thrive in our digital world. Does it feel like the digital world has invaded your home? Is it the uninvited guest at the dinner table? Do you wish that things could “go back to normal”? Are you overwhelmed by the digital demands in your own life and find it hard to remember a pre-smartphone existence? Even parents who use technology all day at work—and to manage their personal lives—sometimes worry about the effect it’s having on their family life. They long for the days of board games and dollhouses, when things seemed simpler. Even TV, prevalent and ever present in American households, seemed easy to manage by comparison. First the home computer became an essential—but it was typically located in a central place in the house, so at least we could keep an eye on what our kids were doing. Then laptops added some mobility, so kids (and teens) could use them out of our sight, and it got more difficult to stay on top of things. Now, many kids have smartphones, which means they are carrying the Internet (with all its best and worst uses) with them at all times. Now, many schools are providing students with a tablet or laptop for home and school use, leaving parents to figure out how such ubiquitous technology fits into the bigger picture of parenting and family life. Even parents who grew up with pagers and mobile phones find that social media and new modes of gaming have created novel parenting challenges. Where do we start in preparing to meet these challenges? Let’s take a brief look at your home to get an overview. This book is all about making your family the source of tech literacy. That doesn’t mean that you have to be a tech whiz, with full command of all devices and apps. It does mean that you will be empowered as a mentor. You will understand the potential of new technologies—and the hazards. You will understand and empathize with the social and emotional experiences of growing up connected. You’ll be able to have honest conversations with other parents about these issues, which will help your own family and which other parents will be grateful for. So let’s get started. To live a balanced life in the digital age, we sometimes need to wrest family life out of the greedy clutches of distraction. In my family, I am the most distracted person (and many parents find that is true of them). I am the founder and director of Raising Digital Natives, a resource for parents and schools. Posting to social media, responding to e‑mail, writing articles to share on my blog, and the other day‑to‑day work could easily be a 24–7 job. Whether you are running your own company, like me, or are working in a larger organization, boundaries between home life and work life have never been more challenging to maintain. As parents, we are more accessible to colleagues and clients than our parents were, even when we are with our kids. Our work has access to us anywhere. The urge to check our work e‑mail early in the morning or late at night can disrupt work–life balance and family life. And you have to admit, e‑mail and Twitter can feel clean and contained, compared with power struggles over snacking and homework, the dishes in the sink, and the other realities of family life. As families, we need to think about what we are sharing—not just with one another, but about one another, too. For many of us, the family album has migrated to social media, and we rarely even print pictures or share them in any other way. How many picture of our kids should we post? Have we ever asked our kids how they feel about what we share about them? It is time to get curious about this. Some parents are constantly sharing pictures and stories of their kids. We should consider the audience—or really, the multiple audiences, in today’s world. We should ask our kids’ permission (seriously!). Later in this book, I’ll dive into the ways asking our kids for permission can prepare them to use social media wisely themselves. Today’s kids use technology to create media, not just consume it. Looking at what they create and share gives us a helpful window into their culture and world. Our curiosity can guide us to learn more about kids’ digital worlds, to understand the pleasures and pitfalls in their day‑to‑day interactions with one another. Our empathy can guide us to support them as they make mistakes and learn to repair them, and grow resilient about some of the ongoing challenges of connected life. This book will give you some strategies you can use to tap into kids’ creativity and your own to cocreate solutions for some of the challenges we face in living digitally connected lives. Aug. 29: What career path to choose, who to marry, whether to have children. A University of Chicago economist tells us how basic economic principles can help you figure out life's biggest decisions. March 21: Constant exposure to digital screens is taking a toll: More than half of Americans report feeling digital eyestrain–discomfort caused from using digital devices.